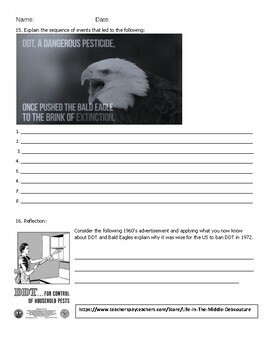 This comprehension question & Eagles and DDT reflection worksheet accompanies NPR SkunkBear (Hyperlink provided) "To Save a Fox" (Eagles & DDT, Human Impact, Ecology, Channel Islands, ecological restoration). 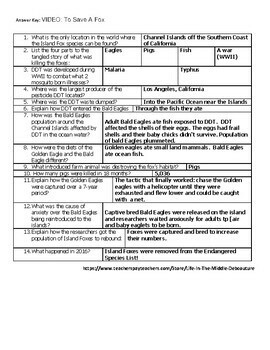 Relates well to the the PBS documentary, Return Flight: Restoring the Bald Eagle to the Channel Islands. 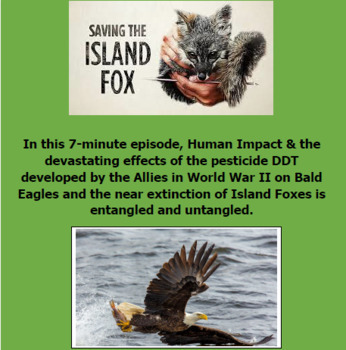 In this 7 minute episode, the devastating effects of the pesticide DDT developed by the Allies in World War II on Bald Eagles and the near extinction of Island Foxes is entangled and untangled. It's an enlightening lesson involving Human Impact, Food chains, introduced species, toxins, and conservation practices. IN our class we watch the video once without the worksheet. 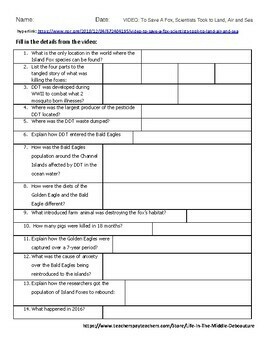 Pass out the worksheet and rewatch filling in as we watch. We then use the answer key on a transparency to correct. The second page/side is then completed silently and independently in class/homework. The answer key for that side/page can be used together or a teacher answer key for student credit.